Present state: The station has been demolished with a housing estate (Bow Lane and Spinney Gardens) built on the site. The retaining wall on the west side of Crystal Palace Parade survives as does the south portal of Paxton tunnel. The vaulted pedestrian subway under Crystal Palace Parade which linked the station with the Palace survives and is a Grade 2 listed building. The subway is securely gated on both sides. The concourse on the east side of Crystal Palace Parade also survives although now roofless; this is also securely gated with no public access. Two bricked up entrances to the station can be seen in the wall on the west side of Crystal Palace Parade, these would have served the concourses at either end of the station. Over the wall steps are still in place down the bank, those at the north end lead to an open area above the retaining wall at the east end of the subway which can be viewed from here. The Farquhar Road bridge survives over the south end of the station site. The site of the turntable on the south side of the bridge is now a car park for the housing estate. Notes: From the south portal of Paxton tunnel the line splayed out into a series of sidings and the impressive terminus designed by Edward Middleton Barry and costing £100,000 to build. The station was built on an excavated ridge below Crystal Palace Parade requiring major engineering works and a high retaining wall. tracks at each end of the station incorporating a booking office, refreshment rooms and waiting rooms. 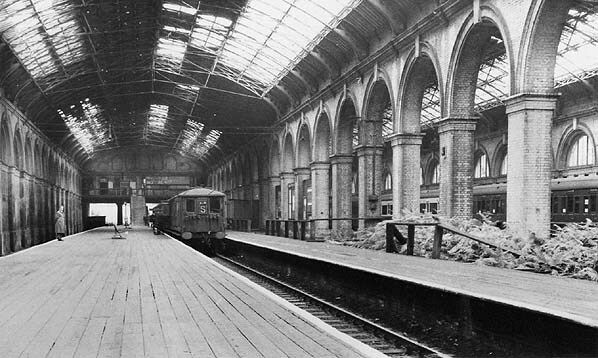 Four tracks entered the station through narrow openings at the London end serving two wooden platforms in each side of the station. The two inner lines had platform faces on both sides to speed the loading and unloading of the expected packed trains. At the far end of the station, the tracks passed through the end walls through a second series of narrow opening to a turntable beyond the bridge over Farquhar Road; this allowed trains to run round and avoid delays. One half of the station was intended for first class passengers, who were given segregated access in the centre transept of the Palace. 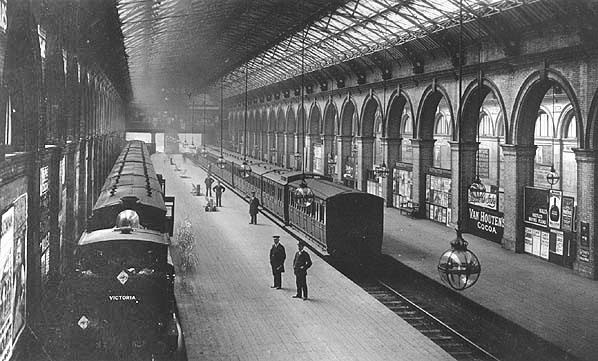 A subway under Crystal Palace Parade linked the station directly with the Palace. 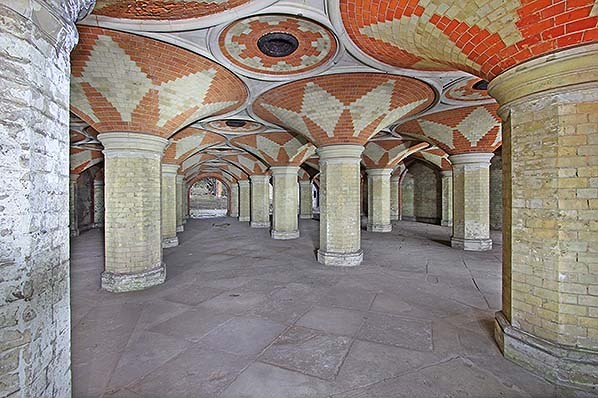 The subway consisted of a wide vaulted and tiled chamber resembling a Byzantine crypt; it was designed and built by cathedral craftsmen brought over from Italy. The roof was supported by a series of octagonal pillars of red and cream brick interlaced with stone ribs. Steps led down from the main floor of the Palace into a further circulating area, adjacent to the subway. Nine sidings were provided to cater for goods traffic and to stable additional locomotives and carriages that could be used to move large crowds away from the station when required; the station could cater for 7000 – 8000 passengers an hour. Sadly the station never fulfilled its potential. Although the opening of the Palace had encouraged the development of Sydenham and Upper Norwood as quality middle-class suburbs, the Palace itself was very much in decline as an attraction in the last decades of the Victorian era. By 1890, extensive repairs were required and ten years later, the Palace had been divided up into booths and stalls, making it look rather ‘seedy’. In order to attract more residential traffic the LCDR renamed the terminus Crystal Palace High Level & Upper Norwood on 1 November 1898 but it did little to improve the stations prospects and those of the Palace also remained in decline. In 1909 the Crystal Palace Company went into receivership; the City of London Trust Fund was then established and part of the building used as a motor museum. During World War I the leaking Palace was employed as a barracks, but, thanks to the City funds, the building once again opened to the public in 1920 and was later used as a temporary War Museum. Even after electrification passenger traffic remained low. A traffic census in February 1926 revealed that 53 trains between 6.05 am and 11.22pm brought only 653 passengers to the station with 703 departing. The station was closed as an economy measure during both wars and during WW2 the extensive sidings were used to store rolling stock that had been made redundant by the war including buffet and second class boat train carriages. The subway and adjacent courtyard survived the 1936 fire and was used as an air raid shelter during the war. 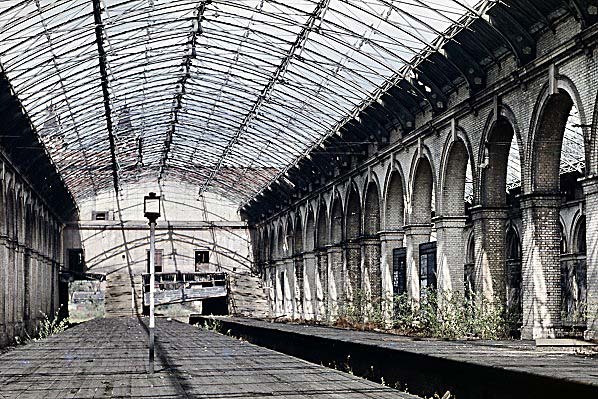 After the war, the station was in a very run down condition, much of the glass trainshed roof had been shattered during relentless bombing and no attempt was made to repair it allowing rain to pour in to the station. As a result the timber platforms were soon covered by vegetation with the rats scurrying under the platforms far outnumbering the passengers. By this time only one platform was in use with the northern stairs, concourse and booking office being abandoned to the elements while that at the other and was little used outside peak hours. Safety nets were draped from the roof to protect passengers from falling debris. After closure the crumbling structure survived until 1961 when the station was demolished leaving only the high retaining wall on the west side of Crystal Palace Parade, the vaulted subway beneath the road and the now roofless concourse at the east end of the subway. This is now a Grade 2 listed building and is occasionally opened for public visits. Once the station site was cleared it was used for temporary car parking in the early 1960’s and in the mid 60’s an estate of prefabs was built on the site. These were however very short lived and eventually the site was redeveloped as a housing estate. Over the years there have been a number of rumours relating to the High Level station. There is a rumour that in one of the sealed tunnels in the area, an engine or carriage remains hidden collecting dust. Another version of the story, popular amongst local schoolchildren, claims that the High Level station was closed because a commuter train was trapped by a tunnel collapse, entombing the passengers who remain there to this day. These stories are an example of the extraordinary persistence of local urban legend. The story of the entombed train was apparently current in the 1930s. Back then it referred to the abandoned 1860s pneumatic railway on the north side of the grounds of Crystal Palace Park. which made it airtight and enabled the coach to be sucked along - at a speed of probably 25 mph. The engineer was Thomas Webster Rammell, a man behind other pneumatic railway experiments in London. Most traces of this had almost certainly been destroyed by the building works for the 1911 Festival of Empire, but there was an unsuccessful archaeological dig for the train sponsored by the BBC's Nationwide current affairs programme in the 1970s. 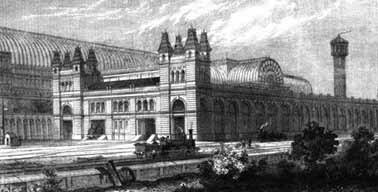 The Great Exhibition in Hyde Park attracted just over six million visitors to the Crystal Palace between May and October 1851. After closure the structure was dismantled and in August 1852 the rebuilding began on a site at Sydenham Hill. The intention was to create a winter park and garden providing the finest display of rare plants and trees and to display replicas of the world’s finest statues; the reconstructed Palace was opened by Queen Victoria in June 1854. To cater for the expected huge influx of visitors the London Brighton & South Coast Railway (LBSCR) opened a station serving the area on 10th June 1854 but the station was not ideally sited and involved visitors walking along a 720ft glass covered colonnade. The station was called Crystal Palace but will be referred to here as ‘Low Level’, a name it didn’t actually get until 1898. It was opened on 1.8.1865 from Cow Lane Junction east of Peckham Rye on the LBSCR to a terminus called Crystal Palace High Level; there were no intermediate stops with 19 trains a day running to and from Victoria, this was increased to 33 trains a day the following year. Two intermediate stations were opened later that year at Lordship Lane (1st September 1865)and Honor Oak (1st December 1865) and a further station was opened at Nunhead on 1st September 1871 to cater for a new housing development. The service to the Low Level Station from London Bridge had been electrified in 1912 and the High Level line was included in the SECR electrification proposals of 1920 but nothing was done until the formation of the Southern Railway in 1923. As part of the electrification Nunhead Station was resited a short distance to the west on 3rd May 1925 and signalboxes at Nunhead Bank, Lordship Lane and Upper Sydenham were closed with only Crystal Palace and Honor Oak remaining in use. 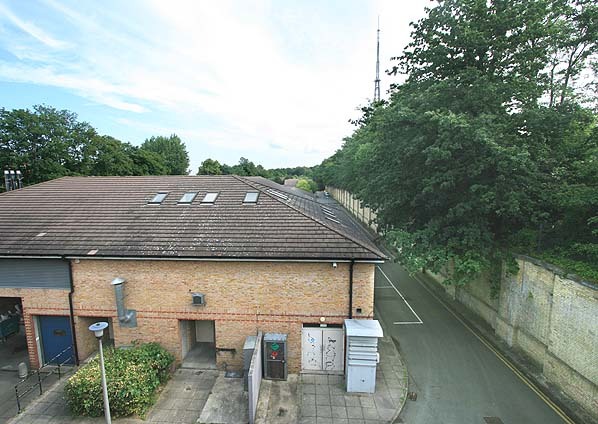 A sub station was built at Upper Sydenham with a shaft down to the Penge tunnel below providing a power cable connection. The third-rail electric service started on 12.7.1925 with a 20 minute service on weekdays from St. Paul’s. 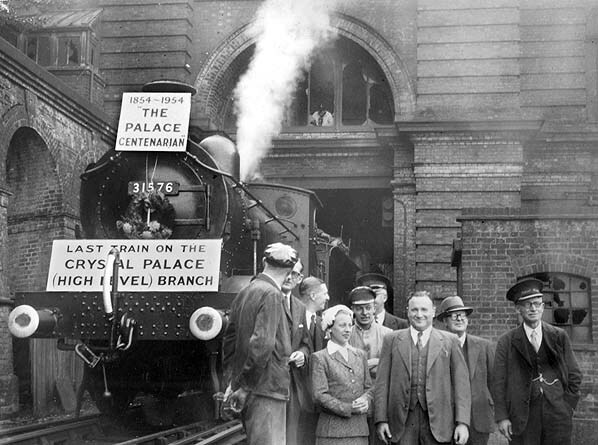 On 30th November 1936 the Palace was destroyed by fire attracting crowds far larger than any seen there for very many years and prompted the last special train for a Palace event with a train being provided for sore-eyed spectators in the early hours. After the fire, pleasure traffic dropped to virtually nothing and when the service was reduced as war time measure in 1940 the remaining passengers began to drift away to other Southern stations, trams and buses. From 6th January 1941 the branch was worked as a shuttle to and from Nunhead but due to the wartime manpower shortage the line was closed on 21.5.1944. After the war, the line reopened on 4.1.1946 when the shuttle service was reintroduced with some peak hour trains to and from Blackfriars. Passenger numbers didn't improve however with many trains during the day running almost empty. With all the stations and the cabling requiring substantial repairs and renewal and no hope of traffic improvement and with more convenient facilities readily available, the line's fate was sealed. Closure was announced in January 1954 with the last electric train running on 18th September that year and the daily freight carrying domestic fuels to the yards at Honor Oak and High Level from Herne Hill ceased at the same time; this was the first permanent closure of an electrified line. On the following day a final steam excursion ran into High Level from Richmond. 1895 1,1056 Ordnance survey map. Click here for a larger version. The last train to leave Crystal Palace was a special excursion on 19th September 1954, the day after the last passenger train ran. Kooking south beneath the trainshed in 1961 shortly before demolition. The site of Crystal Palace High Level Station looking north in July 2007. The retaining wall remains on the right hand side and the south portal of Paxton tunnel can be seen in the distance at the end of the retaining wall. This view is taken from the site of the booking office on Farquhar Road bridge. The pedestrian subway under Crystal Palace Parade in April 2015. This linked the Palace with the High Level Station. It is now a Grade 1 listed building.